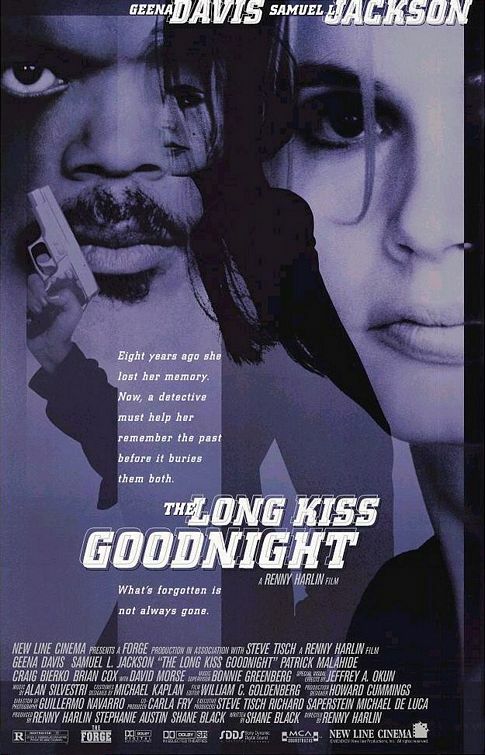 The Long Kiss Goodnight is essentially The Bourne Identity with a female protagonist. The first Bourne novel was released in 1980, and I have to wonder if screenwriter Shane Black was familiar with the book. Both spies are plucked out of the water, suffering from amnesia and must slowly piece together their identities. It just a little too similar. Of course, it’s really only the premise that these two movies share. Their tone and execution are completely different. The Long Kiss Goodnight is a more old school action flick with witty dialogue. There are no quick cuts, here. Just explosions and a good old fashioned “the CIA is out to get us!” plot. What keeps this film from being completely forgettable is the cast. Geena Davis stars as the amnesiac former CIA agent, and Samuel L. Jackson joins her as the private detective she has hired to help uncover her real identity. These two have excellent chemistry, trading quips to rival any buddy cop-type on screen duo. It’s also an interesting turn to have the woman in control of the adventure, and the man unwittingly dragged along for the ride. Again, this works because of the cast. Davis brings real strength to her role and Jackson seems to have no problem playing second fiddle. Both actors know how their parts should be played, and they get the job done. I’m actually surprised that I’d never heard of The Long Kiss Goodnight before. It’s never mentioned in the same breath as other great action films, which is strange. This is every bit as good as a Die Hard or Schwarzenegger action-comedy, and better than most of the Lethal Weapons, in my opinion. My knee jerk reaction is that it doesn’t get much recognition because the lead is a woman, but I also think the title is holding it back. You’d be surprised how easily a long, clever title can alienate audiences. So this is basically The Bourne Identity with a girl. Geena Davis plays seemingly normal housewife Samantha Caine. Samantha has no memory of her life from eight years earlier due to amnesia, but she has recovered to have a daughter (Yvonne Zima) and a husband (Tom Amandes). After bumping her head, Samantha begins to regain her memories, turns out she was a ruthless assassin who still has all the skills that made her one of the best killers ever. Now that she has begun remembering, her former employers don’t want her spreading any of their secrets so they set out to kill her. Sam enlists the help of Mitch (Samuel L. Jackson), a private investigator who can help her recover the rest of her memories. As Samantha begins to remember more and more of her past life, she regains all of her assassin skills until she is completely absorbed by her killer alter ego Charli Baltimore. When her family is threatened, Sam/Charli must defend them and stop her former employers once and for all. This is a cool movie. Geena Davis does a good job as the amnesic assassin. She plays both roles of housewife and assassin believably. Sam Jackson is also a lot of fun as the private investigator who gets more than he bargained for when he helps Sam uncover her past. Jackson is always fun and this is no different. This must have been one of the last R rated movies to come out before Hollywood became obsessed with PG-13 films. The film is gory and bloody with plenty of F-bombs. I feel like if it was made today, The Long Kiss Goodnight would be watered down to a PG-13 shadow of itself. As it is, the film is entertaining. The film was quite a departure for Geena Davis who was more well known for her dramatic or comedic roles like A League of Their Own or Thelma and Louise than being an action heroine. I am sure the fact that the director was her then husband, Renny Harlin, probably had something to do with her appearance in this film though. It was also funny to see the future Dr Abbot, Tom Amandes, from Everwood as Sam’s husband. I loved Everwood and it was fun to see someone from the cast before that show. The only other people I had seen before was Treat Williams and Brenda Strong. There is not much more to say about this film. It is a solid action film that definitely is not great, but not terrible either.